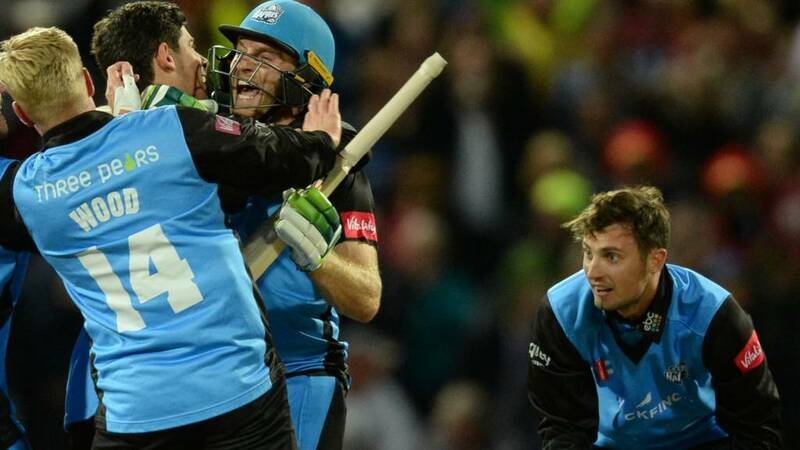 So that's another T20 Blast Finals Day done and dusted - and it's a day of delight for Worcestershire and their supporters as they win the trophy. The Rapids were ably led by Moeen Ali - a potential future England captain, perhaps - and they also had the day's star performer in Ben Cox, as well as the youthful bowling excellence of Pat Brown. Thanks for your company throughout the day. Our next text commentary will be on Tuesday from about 10:15 BST when the penultimate round of the County Championship gets under way. Hope you'll join us for that. We knew we were under par, I thought they bowled outstandingly well, we fought all they way but credit to Worcestershire - congratulations to them they outplayed us. Both clubs are trying to bring young English players through, to have a day like this for them is good for England. I'm hugely proud of the boys, it just wasn't to be. I just knew we were going to win today. We were amazing. We won the crucial moments in the game. Credit to (former director of cricket) Bumpy Rhodes, who brought all these guys up and we're reaping the rewards. We pride ourselves on being a family club and we've made them wait long enough for a Finals Day. It's a great day for us but this is for the fans. It's hard to take it all in. They are the youngest team in the competition - and they are the T20 Blast champions. A fantastic effort on their first appearance at Finals Day by Worcestershire Rapids, superbly led by their skipper Moeen Ali. For a little county like Worcestershire to come up and play with the big boys like we have is unbelievable. To come to finals day and perform like this, days like this don't come around often. What a day, our first time here and to come and do that, we're pretty pleased. It might take a bit of time to sink in but the way we've played white ball cricket for two years - we've been pushing for this moment. Pat Brown has been our standout bowler throughout this competition and turned up today. I'm absolutely delighted for Worcestershire, they've played so well. This Worcestershire team is a lot of people's second team because they are a young team, they do things the right way. They really deserve it. Jofra Archer digs in a short one, Ben Cox pulls it away and that's job done for Worcestershire. Cox adds an unbeaten 46 off 27 balls to his half-century in their semi-final win over Lancashire - surely he's got to be the player of Finals Day. For once, Sussex's vaunted death bowlers can't get the job done for the Sharks, who must now focus on trying to win promotion in the County Championship. They looked favourites with Worcestershire needing 31 from the last 18 balls, but Cox's inspired hitting saw the Rapids home with nine balls to spare. First T20 final - first T20 trophy. Superb! Oh dear - the ball slips out of Jofra Archer's hand. It's a beamer, it's four no-balls and it's a free hit. The free hit disappears over square leg for six - and suddenly Worcestershire are almost there. Jofra Archer yorker. One for Ed Barnard to deep extra. Great shot by Ben Cox, who steps out of his crease and flicks away a low full toss by Chris Jordan for four. But how does the next one miss the stumps as it bounces down off the under-edge and just clears the bails. 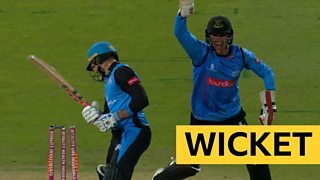 Worcestershire are running for everything now - they take a bye to the keeper as Ed Barnard plays and misses and Cox nails the next one straight and it's a big six. A stroke of luck for Cox to end the over as his sliced drive just clears the fielder at short extra and he takes two. Just 17 from two overs needed now. Here are a few of the Worcestershire wickets from earlier in their run-chase. The batsmen crossed while that ball was in the air and a perfect yorker to end the over by Jofra Archer permits only a single for Ben Cox. Worcestershire need 31 from 18 balls. Worcestershire need some boundaries - and quick. Ben Cox duly obliges with his patented reverse flick, using Jofra Archer's pace against him. 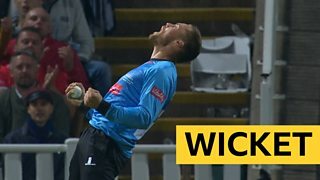 The fast bowler tries for a yorker, but it's not quite there and Cox hammers it over a leaping Chris Jordan for four more. A single follows from the next and the onus is on Ross Whiteley, but he doesn't make clean contact from a low full toss and Jordan dives in the deep for a great catch. A good start for Worcestershire as Ross Whiteley pulls off his hip for four. Tymal Mills produces a slow bouncer next up and the left-hander has to let it hit his body after playing far too early. Worcestershire run a leg bye bringing Ben Cox onto strike but he doesn't make a clean contact to a switch hit and has to settle for one. Whiteley ends the over by pulling away, but it's just another single - and the required rate is now well over 10 an over. Chris Jordan returns. He's only bowled one over so far. Like team-mate Jofra Archer, there's some weighty gold stuff round his neck - but I bet he'd be willing to swap it for the trophy that's at stake in this match. Jordan's disciplined line and length proves hard to get away - just five from the over. The pressure on Worcestershire increases - 49 from 30 required. If Ross Whiteley bats for three or four overs then Worcestershire will win.